Mutual fund investors poured some $17 billion into domestic equity funds in January, reversing 2012’s trend, according to the Investment Company Institute (ICI), an industry trade group. But it’s too early to declare that fund investors have fully recovered from the 2008 market collapse, even as the bullish S&P500 stock market index flirts with its 1,565 all-time high reached on October 9, 2007. Fund investors surveyed by ICI still remain less willing than they were prior to the big bust to take what the survey questionnaire calls “above-average or substantial risks” in their investments. This trend cuts across most age groups, from 40-somethings to retirees. The exception is the under-35 crowd: 26 percent identified themselves as being in these higher-risk categories, slightly more than the 24 percent who did back in 2007. But boomers nearing retirement and current retirees burned in the 2008 market collapse keep paring back their risk profiles. Older investors are moving “from capital appreciation to capital preservation,” said Shelly Antoniewicz, an ICI senior economist. 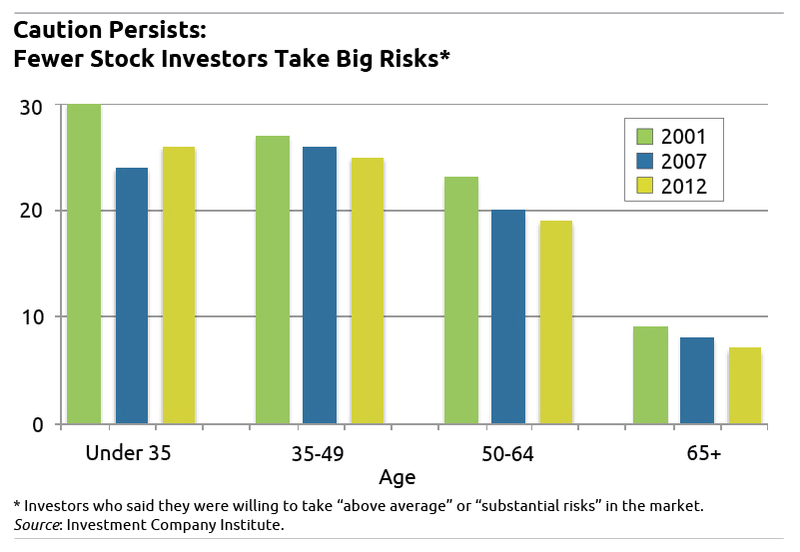 Even 35-49 year olds, who still have two to three decades of investing ahead of them, are not quite back to where they were earlier in the decade when they were more willing to take risks in the stock market. There are other indications of lingering caution, though not outright fear. The share of fund investors who have 80 percent or more of their portfolios in the stock market is far lower than it was a decade ago, and fund investors are also diversifying more. Again, this is most pronounced among 401(k) investors and older investors approaching or in retirement. Since 2000, the share of baby boomers investing more than 80 percent in stocks in their retirement plans has dropped in half, to about 25 percent for 50-somethings and 21 percent for 60-somethings in 2011, the most recent data available. So, how does Antoniewicz explain January’s dramatic run-up in stock-fund buying? She said January is often when investors move into equity mutual funds as they make tax-deductible contributions to their IRAs before the IRS’ April 15 deadline. Funds also become a popular depository for year-end bonuses. Finally, one unique factor that may’ve spurred January’s stock inflows: individuals reinvesting after selling off profitable stock holdings last year in anticipation of the rise in capital gains rates. If “fully recovered” means that investors have gone back to being the dupes of Wall St and the mutual fund industry that the were in 2008, it is my sincere wish that they never recover. This must be difficult for Boomers. And this must be very devastating to the economy of your country. I think it will take time for investors to be able to fully recover from the crash last 2008. Thank you for this post! I’m looking forward reading more of your posts. @ AZ World. Thank you for your concern. On behalf of all Boomers, I hereby request foreign aid from your government to bail us out. Can you please provide a link to the ICI document this is sourced from? Thanks. The Investment Company Institute’s risk tolerance data are in Figure 11A. See Figure 30 for the percent of accounts invested in stocks. If you’re interested feel free to send me an email. I look forward to hearing from you! Wonderful blog by the way! Unfortunately, we do not currently have a forum for guest blog posts. Quite interesting, loving the blog so far.